What is a whetstone and how to use it? 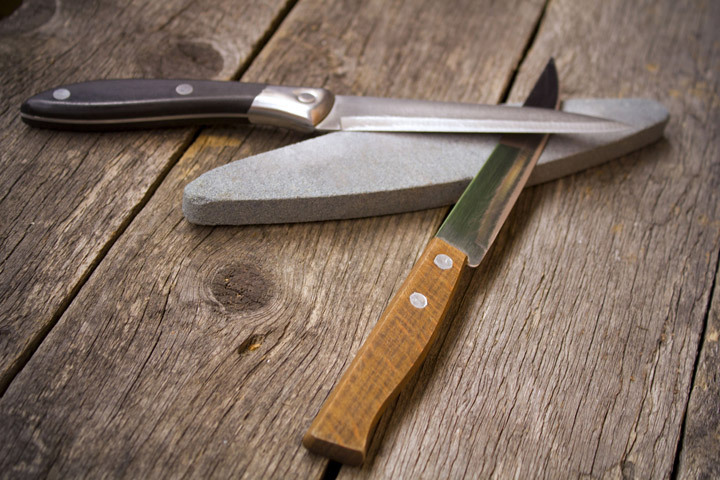 Whetstones, also known as sharpening stones, are natural or synthetic stones used to sharpen knives. They’re made of different materials and have a different grit level. When running the knife’s sides back and forth across the surface of a whetstone, it will transform the dull edges, sharpen the knife or give it a nice, polished finish, depending on the type of the whetstone. Sharpening a knife using a whetstone can look complicated but actually, it is not. All you need to do is to make sure that you’re holding the knife at the right angle when rubbing against a stone and you’re almost done. 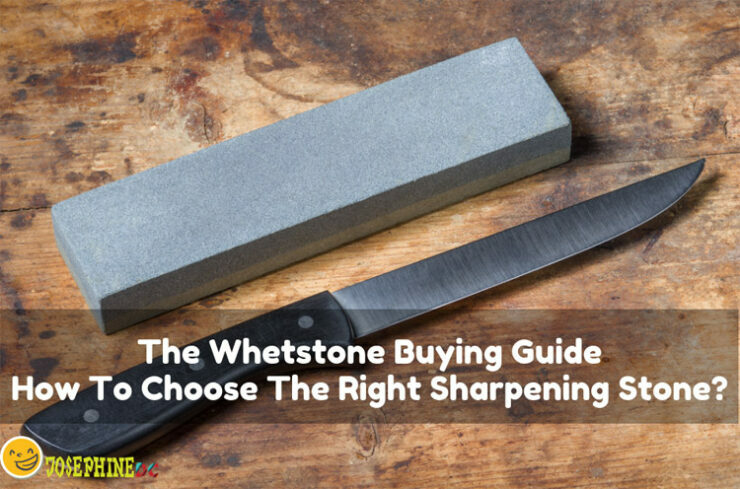 There are so many whetstones available on the market that you’re probably confused and don’t know what to consider when buying. I hope that this section will make your choice easier. Always look for a whetstone that has the right length and width for your cutting tools. 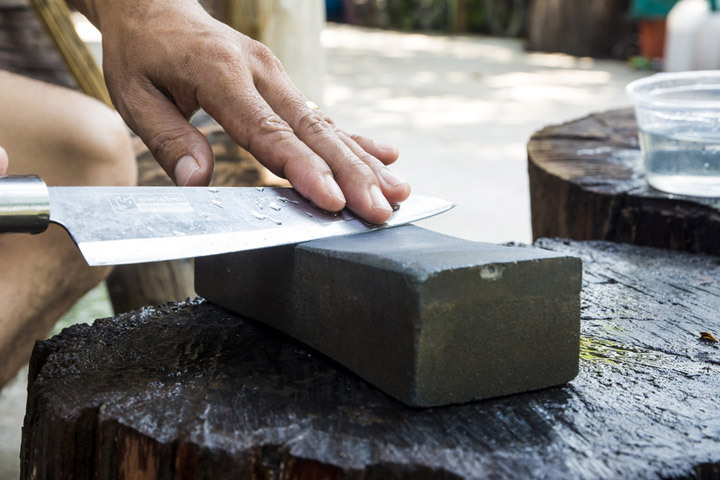 Getting a whetstone that is too small will not only prevent you from sharpening bigger knives but also make the process more frustrating and unsafe. If you use a whetstone just for kitchen knives, get a whetstone that is around 6 inches long. However, if you plan on sharpening tools that are longer, you should consider getting a sharpening stone that is longer than 8 inches. There are 4 major types of whetstones available on the market that have their own advantages and disadvantages. Let’s see what are those 4 types of sharpening stones and their characteristics. Water stones are one of the most commonly used whetstones. As their name suggests, most of them need to be soaked in the water before using. They are some of the best whetstones to choose from but that doesn’t mean that they’re flawless. Due to repetitive soaking and drying, they can become very brittle so you’ll need to replace them after a while. Similar to water stones, oil stones need a splash of oil on their surface before sharpening. This way, the knife’s metal residues will be cleared away during sharpening and prolong its lifespan. Oil also makes the sharpening process much smoother but also slower and messy. Moreover, you can only use the honing oil. If you’re looking for a whetstone that will last for many years to come, you should consider getting a ceramic stone. Ceramic is a really hard and long-lasting material but also brittle. Invented as the replacement of natural sharpening stones, the ceramic sharpening stones don’t require water or oil before using. However, that doesn’t mean that you should leave it like that after the usage. Scrub the particles and remove them from the whetstone’s surface after you’ve done. Proper maintenance is a must if you plan on buying a ceramic sharpening stone. Another downside of ceramic sharpening stones is that they vary in quality so be careful and check the reviews if they’re available before buying it. These are the best and most expensive whetstones currently available on the market. Despite their high price, the popularity of these whetstones has increased substantially in recent years. The diamond whetstones are made of metal or plastic plates with a very small diamonds adhered on top. There are two types of diamond sharpening stones. The more common type is the one that has holes in the surface while the other has continuous diamond surface without holes. Similar to the ceramic stones, diamond sharpening stones can be used dry and are quite durable but you need to pay a higher price for this type of whetstone. You’ve probably seen that most whetstones have a number etched on its surface and you don’t know what it means. This number represents the grittiness or coarseness of a whetstone. The lower the number the grittier the whetstone is. Each grade of grittiness will sharpen your knife differently and therefore has a different purpose. Depending on the number, all whetstones are divided into 3 categories- coarse, medium and fine stones. Coarse sharpening stones are the ones with a number less than 1000. These whetstones are primarily used for damaged and extremely dull knives. They don't leave a nice finish so they shouldn't be used if your knife is not that dull or damaged. Medium sharpening stones are the ones with a number ranging from 1000 all the way up to 4000. The whetstone with a number 1000 is a basic stone for sharpening. Whetstones with a number range from 4000 to 8000 are the fine or finishing stones, used to achieve a super refined edge. You don’t want to spend money on something that is not made of quality materials and won’t last long. Choose a product carefully, especially if you plan on buying a ceramic or more expensive diamond whetstone. However, you should also know that longevity sometimes doesn’t have to do with the quality of the product. Water stones are less durable than diamond stones because of the nature of the materials used. Now that I’ve told you what to consider when buying a whetstone, I present you my top picks for sharpening stones currently available on the market. This product by Sharp Pebble is a complete knife sharpening kit that includes not only a premium quality whetstone but also a bamboo base for holding the stone, knife sharpening angle guide and a simple instruction manual with tips and tricks that appeal to every skill level. It is a two-sided sharpening stone with the 1000 grit side for removing chips and nicks of the blade and the 6000 grit for a nice, smooth and polished finish. You don’t need to buy two separate products, you can have them all-in-one. Unfortunately, the 6000 grit side is too soft and is unexpectedly more difficult to get a nice polish. Moreover, I’ve also noticed that some of my knives would cut through the whetstone and make dents on it. The bamboo case along with a rubber base holds the stone in place, providing sharpening that is free of accidents and frustrations. There won’t be any sliding while you sharpen your cutting tools. Because it is a water stone, the water will also get in touch with a wooden base so there is always a chance that the wood will start tearing apart after a while. If you want your bamboo base to last longer, make sure you wipe and dry after you’ve done with usage. Double-sided whetstone with both grittier and finer side. The bamboo base with rubber holds the stone in place while sharpening, preventing any injuries and frustrations. Suitable for various types of knives and other cutting tools like scissors, razors etc. The finer side is too soft making it harder to get a nice polish. It needs to be soaked in water for 10 to 15 minutes before using. The wooden base can tear apart because of the water. If you’ve liked the previous product, but you’re not sure about the quality of a finer side, maybe you should consider getting this product. This sharpening stone set made by Poseidon Stones is similar to the previous one but with different grit level. The whetstone is a double-sided aluminum oxide stone that has a 1000 grit side for dullness removal and a 4000 level grit side for additional sharpening and finishing touches. It can be used with almost any type of knives as well as other cutting tools. It is rare for a manufacturer to include a flattening stone in a package and I really appreciate this gesture. You don’t have to spend an additional amount of money on a flattening stone. Do you need a flattening stone? Well, while it’s not obligatory it is recommended. You see, over time, every synthetic whetstone will get dents and become uneven from all the sharpening. Uneven surfaces will make sharpening harder and you won't get the same results as before. In order to get it back to the original shape, you need to flatten the sharpening stone and this is where a flattening stone comes to help. This is a water stone so it doesn’t need oil before using. Just soak it in the water for a couple of minutes and you’re ready to go. If you’re not sure about the angle in which you need to hold the knife while sharpening, this set also included a guide that will help you. Double-sided whetstone with 1000 level and 4000 level grit for best results. Comes with a bamboo and a rubber base for safe usage. Can be used for different types of cutting tools. The flattening stone is included in the box. Because of the water, the bamboo base can develop mold and tear apart. There is no instruction booklet. It is on the bulkier side. If you’ve perfected the skill of sharpening using a whetstone and two grit levels are not enough, this model by DMT can be a good choice for you but it comes with a much higher price. The set comes with 3 one-sided diamond whetstones that have different grit levels- extra fine to polish and refine the edge, fine for a razor-sharp edge and coarse to transform a dull edge. This way you will use just one product to repair dull knives, sharpen and refine them as well as give them that nice polished finish. The whetstones have the appropriate size to accommodate regular-sized knives and cutting tools. Moreover, you can use it for almost any type of tools. It can also be used to sharpen both straight and convex blade edges. As with all diamond whetstones, no oil is required before using. You can just use it dry or with water. The manufacturer claims that it has created a durable and long lasting whetstone by using superior mono-crystalline diamonds that can sharpen the edges faster than other diamond and conventional whetstones. Actually, they are so confident in their product that they offer a 100% replacement guarantee if you find it to be defective. 3 single-sided diamond whetstones with three different grit levels for best results. It can be used dry or with water. It can be used for most types of knives and cutting tools. Whetstones come in a nice wooden box. More expensive than other products from the list. The wooden box has questionable quality and longevity. The surface may be too small for larger knives. Angle guide is not included. The manufacturer claims that it has created a durable and long lasting whetstone by using superior mono-crystalline diamonds that can sharpen the edges faster than other diamond and conventional whetstones. Actually, they are so confident in their product that they offer a 100% replacement guarantee if you found it to be defective. Looking for a double-sided ceramic whetstone that has lower grit levels? Look no further because this whetstone by Fallkniven has all you’re looking for. The manufacturer claims that this whetstone will handle even your finest sharpening needs. As I’ve previously mentioned, this product has two sides with different grit levels- the white side made of superfine ceramic stone and a grit of 800/120 and the dark gray side with a grit of 1400-2000 made of synthetic sapphires. As with all ceramic whetstones, you don’t need to add any water or oil, you use it dry. The white side will sharpen the edges while the dark grey side will give you a polished finish. Maintenance is also really easy. Just wash it with water and soap after you finish and store in a leather pouch that is included. This way you will protect it from damage and breaking. Made of durable, long-lasting ceramic. Dual-sided whetstone with both grittier and finer sides. Doesn’t require any water or oil. Comes with a leather pouch for protection. The grittier side is not coarse enough to repair dull and damaged knives. Doesn’t come with a holder to prevent moving while sharpening. Sometimes you’re out in the wild camping and you didn’t get a chance to sharpen your knife. Thankfully, there are small pocketable sharpening stones that can come in handy and the Lansky Puck can be a great choice. It has the right size for everyone that need to sharpen their knife outside of their home. It is suitable for various kinds of tools, even axes so if you’re into camping, you should bring this whetstone with yourself. This pocket-sized whetstone is double-sided with a grit of 120 on one side and 280 on the other. Because both sides are coarse, it is better for repairing damaged and dulled knives and transforming their edges than sharpening or putting finishing touches. Unfortunately, the size of this whetstone is also its downside. I’ve always had a feeling that I’m going to hurt myself since my fingers are so close to the knife’s edges. It is so small that you can put it in your pocket. Two sides with different grit levels. Both sides are too coarse so it isn’t good for finer sharpening. The finer side is not that durable as the grittier side. If you’ve read the whole post, you’ve probably realized that getting the right sharpening stone can be pretty hard. In addition to serving all your needs, the whetstone also needs to be long-lasting, durable and high-quality. With so many options available on the market, getting the wrong one is much easier than getting the right one. If you’re looking for a whetstone that is the best for a beginner, I recommend getting a set made by Poseidon Stones. The grit levels are just right so they won’t ruin your knives. Moreover, it also comes with an angle guide and flattening stones that will make your sharpening easier. I hope that with this post you’ve learned more about whetstones and that I’ve made your choice easier.